Welcome to the Middle Level Section of NCTE ------ your home in the middle! The NCTE Linda Rief Voices from the Middle Award recognizes an outstanding publication in Voices from the Middle written or co-written by classroom teachers or literacy coaches. Many of today’s recognized authors and experts published their early work in Voices from the Middle and this award aims to support the development of future voices to lead our profession forward. The Middle Level journal Voices from the Middle has a new set of editors and a whole new way of sharing the excellent content and ideas. Under the leadership of Sara Kajder and Shelbie Witte, Voices has launched an engaging podcast, digital-only content, and a vibrant Facebook page. Keep up with the latest developments by following the new Twitter handle: @VoicesNCTE. Experience all the fresh ideas flowing out of this wonderful journal and learn how you can write for Voices from the Middle. Not yet a subscriber? 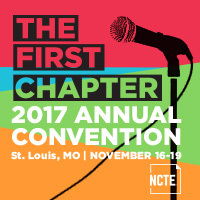 Add Voices from the Middle to your NCTE membership today! NCTE members enjoy online access to ALL journals published more than two years ago. Go Green! Make a long-term impact on the environment by receiving Voices from the Middle-Green today! This document was printed from http://www.ncte.org/middle.